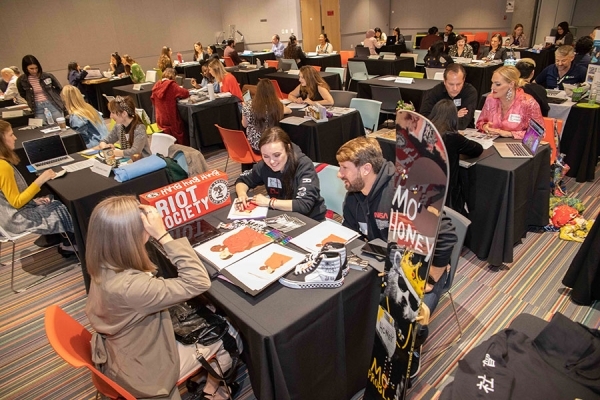 Brand New School, Framestore, Guess?, LA Metro, and Lucky Brand are just a few of the employers featured at this year's Intern Recruitment Day at Otis College of Art and Design on March 28, 2019. BFA students presented their portfolios and met with recruiters looking to onboard the latest talent in art and design. "The Otis advantage for students is the career-oriented culture of our community. From our faculty to our staff, everyone at Otis is committed to the professional development of our students," said Jason Barquero, Executive Director of Career Services. "Students have come to expect a year-round effort in preparing them for internship and full-time employment opportunities, that is demonstrated through large events such as our annual Intern Recruitment Day, Senior Exhibition, employer/alumni lunchtime visits, on-campus portfolio reviews, and many other ongoing recruiting efforts.” See more of what Career Services has to offer. In a poll of the 2018 graduating class, 93% of responding students indicated that Otis College prepared them for the working world. Two out of three students participated in an internship prior to graduating and 92% of recent graduates were employed or in graduate school within one year. Recruiters and the public alike will have the chance to see the work of the Class of 2019 at the upcoming Annual Exhibition in May.